. :: INVESTIGATING POOR PERFORMANCE WITH FIELD EXERCISE TESTING ::. EVOLUTION HAS MADE HORSES EXCEPTIONAL ATHLETES, SURVIVING THANKS TO SPEED IN ORDER TO ESCAPE PREDATORS, AND ENDURANCE IN ORDER TO COVER GREAT DISTANCES SEARCHING FOR GRASS AND WATER. HUMAN SELECTION HAS BROUGHT THESE CHARACTERISTICS TO EXTREME LEVELS. The superior performance of horses is mainly based on their exceptional maximal aerobic capacity (maximum amount of oxygen that the body can utilize during exercise), remarkable high muscle mass with large energy stores, the ability to increase the blood’s capacity to transport oxygen when needed, their efficient gait and body temperature regulation. The respiratory system is ultimately considered the limiting factor to high intensity exercise in horses. Horses can only breathe though their nose and the upper airways of horses are long and narrow increasing the resistance to airflow. Also the respiratory rate during canter and gallop is mechanically coupled to stride frequency so that a horse can only take one breath with every step. More than half of a horse’s body weight consists of muscle in contrast to only 30 to 40% of most mammals (including us) and during exercise almost 80% of the blood pumped by the heart goes to the musculature. Skeletal muscle is made up of bundles of individual muscle fibres. In general they are classified under two main types: slow twitch muscle fibres and fast twitch muscle fibres. Equine muscles contain a genetically determined combination of both slow and fast fibre types as a result of breed selection for each specific use. Slow twitch fibres are more efficient for continuous, extended muscle contractions over a prolonged time and they can go for a long time before they fatigue. Fast twitch fibres are much better at generating short bursts of strength or speed. However, they fatigue more quickly. 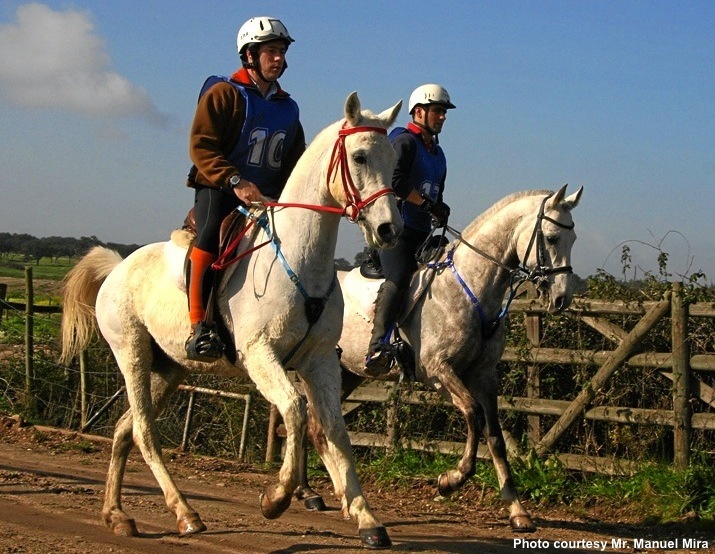 An Arab endurance horse has a higher percentage of slow twitch fibres to allow him to run very long distances (Figure 1) while a Thoroughbred or Warmblood horse has faster twitch fibres required for sprint or to jump obstacles. Training can positively or negatively change the composition of the equine muscles; however a common mistake is to constantly train show jumping horses with mechanical exercisers or treadmills developing endurance but loosing in consequence the power needed to jump. Horses have a very large spleen that store up to one-half of the horse’s total oxygen-carrying red blood cells. This gives horses the ability to naturally “dope themselves” when exercise induces the spleen to contract raising red blood cell concentration in the circulatory system and dramatically increasing blood’s capacity to transport oxygen to the musculature. The heat generated by an exercising horse can increase its body temperature by 3 to 5°C. This heat dissipation is achieved by evaporation of sweat, evaporation of respiratory tract secretions and transfer of heat in air moving over the horse’s skin and respiratory surfaces. This mechanism is less efficient in hot and humid environments increasing risk of heat shock. Veterinary field exercise testing is a very useful tool to assess fitness and health during competition season, develop a training strategy or investigate the causes of decreased performance. This is best made with the horse exercising in regular working condition or simulating competition situations. Because of their simplicity, the most used and useful parameters evaluated in the field are heart rate, speed and blood lactate level. Heart rate is usually expressed relative to a steady submaximal speed, such as V200, the velocity at which the horse’s heart beats 200 times per minute. This speed ranges from 500 to 900 meters per second (30 to 54 kilometres per hour). Training progress is correlated with an increase in V200. Overtraining, unfitness, lameness (pain), excessive weight and cardio-respiratory diseases decrease the V200. Lactate is produced in the muscles during intense power exercise when oxygen supply is insufficient (anaerobic metabolism). 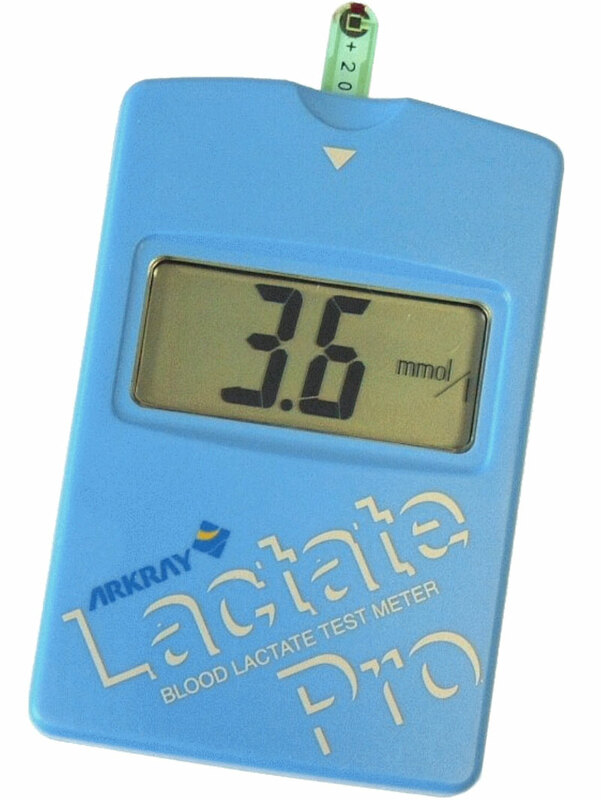 A concentration above 4 mmol/l of lactate in blood is considered an indicator of a horse passing from aerobic to anaerobic exercise. Blood is obtained from the jugular vein immediately after exercise and lactate is measured using a test strip system (Figure 3) delivering results immediately. Lactate measurement after submaximal speed exercise is a useful method to distinguish poor and good performers, detect cardio-respiratory and muscular diseases and to monitor the changes in fitness throughout training programs. Standardized field exercise tests consist of at least 3 consecutive incremental steps of intense canter or gallop with short stops for recovery and blood collection. Reaching the full expression of a horse’s potential requires a balance between nutrition, environment, training and veterinary check-ups to help in the prevention of illness and injuries. Regular blood testing is a simple and efficient way to monitor a horse’s health status, discover early signs of fatigue and evaluate recovery. A low red blood cell count (anaemia) indicates a decrease in the oxygen transport capacity of the blood, overtraining can cause reduced withe blood cell counts (leucopenia), some blood enzymes like creatine kinase (CK), lactate dehydrogenase, (LDH) and Aspartate transaminase (AST) are markers of muscle damage and serum total protein level is a good general index of hydration, nutrition and general condition. Interpretation of this information together with results of the field exercise tests may help veterinarians detect subclinical diseases or overtraining. The heart of an equine athlete can weight almost 10 kilograms and pump up to 1,5 litres of blood with every heartbeat flooding the circulatory system with over 300 litres of blood every minute during maximal exercise. Cardiac arrhythmias can be easily missed if the exam is performed only at rest because they usually occur only during exercise. Modern telemetric exercise ECG systems can record the electrical activity of the heart and transmit it throughout a training session. Atrial fibrillation is the most common arrhythmia associated with reduced performance. 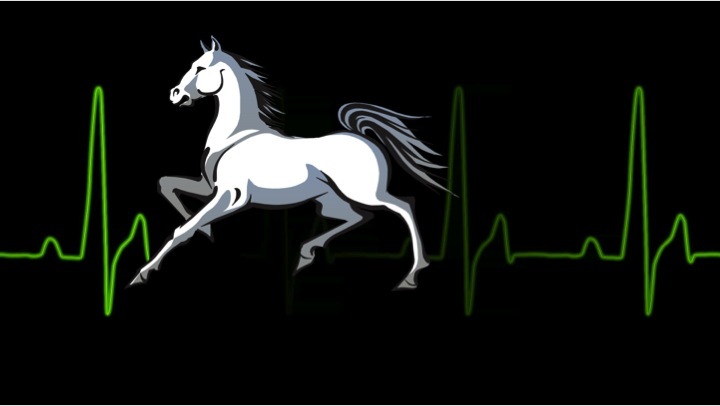 Athletic and older horses tend to have a high prevalence of cardiac murmurs, however many of them are considered physiological or “innocent” heart murmurs with no clinical implications. Doppler echocardiography helps to establish a definitive diagnostic and prognosis. Respiratory problems are described as being a main cause of exercise intolerance and poor performance in sport horses. Some disorders reduce the diameter of the upper airways causing a dramatic increase in turbulence and resistance to airflow. According to Poiseuille's law, when the radius of the windpipe is halved, the resistance increases by 16-fold! The two best-known problems of the throat, because of the distinctive noises they produce, are laryngeal hemiplegia (inspiratory roaring) and dorsal displacement of the soft palate (expiratory gurgling). Surgical intervention is the treatment of choice for these conditions. Riders should also be conscious that excessive head flexion (rollkur) is now also recognized as a cause of significant upper respiratory tract resistance. Flexible endoscopy is the diagnostic method of choice for upper airways tract disorders. Recurrent airway obstruction (RAO), inflammatory airway disease (IAD) and exercise induced pulmonary haemorrhage (EIPH) are the leading lower respiratory tract disorders responsible for poor performance. RAO also known as ‘heaves’ is a chronic and recurrent condition similar to asthma in people. It affects more frequently older horses housed in stables with moulds, poor ventilation, dusty bedding and fed with hay. IAD is disease seen more commonly in young athletic horses associated with cough, increased respiratory secretions and exercise intolerance. Environmental dust is a major cause in conjunction with many other factors (viruses, allergens and management). Cytology of the fluid obtained by endoscopic tracheal wash (TW) or bronchoalveolar lavage (BAL) or “lung wash” aids to establish a final diagnostic. The improvement of the environment in the most important step for the management of these two conditions. Aerosol therapy with bronchodilators and glucocorticoids also help alleviate airway constriction and inflammation. 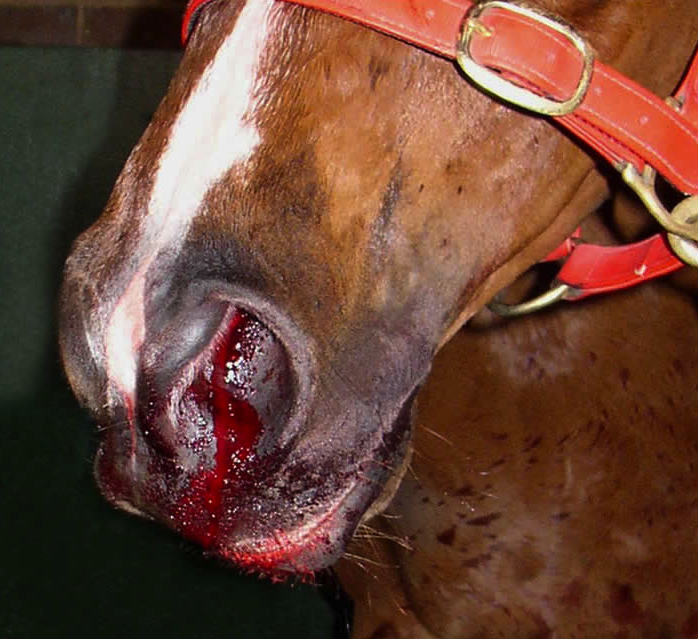 Even though EIPH is a very common disease in racehorses, only 5% of horses affected show blood coming from the nose or ‘epistaxis’ after exercise (Figure 4). Therefore, diagnostic is based in endoscopic airway examination or by evidence of blood in fluid obtained by TW or BAL. Bleeding is a consequence of the rupture of pulmonary capillaries causing inflammation and pulmonary fibrosis and therefore reducing performance. Diuretics (Furosemide) are commonly used to prevent EIPH by reducing pulmonary vascular pressure although its efficacy is controversial. Recurrent exertional rhabdomyolysis (RER), often called ‘tying-up’, is a condition seen more frequently in Polo and Thoroughbred young mares with a nervous temperament. It is a potentially life-threatening condition characterised by post-exercise gait stiffness, muscle pain, sweating, muscle cramping and fasciculation. Horses undergoing an episode of RER should not be moved to avoid further muscular damage. Overfeeding with grain is pointed as a main cause of RER. Treatment is based on fluid therapy, vasodilators (Acepromacine) and prevention through dietary management and supplementation with vitamin E and selenium. Understanding unique equine physiological attributes, the specific disorders that affect them and how they relate to each other, is mandatory to efficiently manage and train a horse during his competitive sports career. 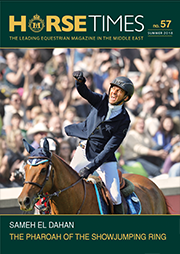 This is best accomplished when horse owners, riders, trainers and veterinarians agree that ‘at all times the welfare of the horse must be paramount’ honouring the FEI’s Code of Conduct. 1. FRAIPONT, A., (2009) Intérêt du suivi sportif à la piste des chevaux d’endurance dans la détection des problèmes subcliniques. 35ème Journée de la Recherche équine. Paris., pp 179-186. 2. HERHOLZ, C., (1994) Beeinflussung der Leistung im submaximalen Belastungsbereich durch den Gesundheitszustand der Lunge beim Pferd. Pferdeheilkunde 10, 419 -422. 3. HINCHCLIFF, K.W., GEOR, R.J. (2004) Integrative physiology of exercise. In: Equine Sports Medicine and Surgery, 1st edn., Elsevier, London, pp 3-8. 4. RICKETTS, S.W. (2004) Hematologic and biochemical abnormalities in athletic horses, In: Equine Sports Medicine and Surgery, 1st edn., Elsevier, London, pp 949 – 966.